"I've just bought a new Apple TV and I want to watch .avi files on it. All of my films and the TV shows are in .avi. Is there any way to play AVI on Apple TV or could you introduce me an efficient AVI video converter to convert AVI to Apple TV supported formats?" It is an undeniable fact that AVI is a media container format and can contain audio/video data compressed by various codecs like DivX, XviD, WMV, etc. Certainly, most of AVI files on the market are encoded with these codecs. But, Apple TV only supports playing AVI video encoded with Motion JPEG. So, it is normal that you can't play AVI files on Apple TV. To play any AVI files on Apple TV, you are suggested to depend on these two practical approaches: convert AVI to Apple TV MP4, MOV, M4V, etc and then stream it to Apple TV via iTunes or 5KPlayer; download AVI video player for Apple TV. * easily convert AVI to Apple TV MP4, MOV and M4V with original quality reserved. * world's No.1 fast conversion speed due to the application of multi-core CPU utility, hyper-threading tech and Intel Quick Sync Video hardware acceleration tech. * directly convert & compress AVI to Apple TV 3, The new Apple TV, iPhone X/ 8, iPad Mini/Pro, Samsung Galaxy S8/S7 and more 350+ preset profile for playback with ease. * seamlessly convert any video to over 180 video formats and 14 popular audio formats, such as MKV to AVI, MKV to MP4, AVI to MP4, VOB to MP4, FLV to MP4 , MP4 to MP3, etc. * free download online videos for Apple TV from 300+ online sites including Facebook, Yahoo, Dailymotion, Vimeo, Vevo and more. Before converting AVI to MP4/MOV/M4V, you ought to download this AVI converter on your Mac computer (macOS High Sierra supported); please download Windows version (Win 10 included). Step 1: Launch this AVI video converter for Mac/Win and import AVI videos by clicking "+Video" icon. Certainly, you also can drag and drop AVI files you want to convert to the main interface. And batch conversion is supported. 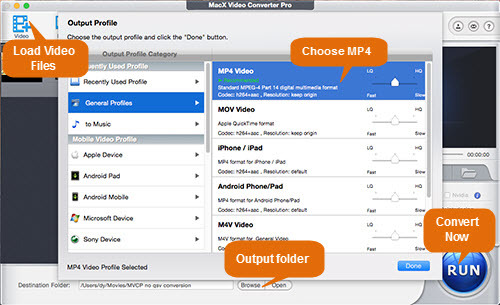 Step 2: Choose Apple TV or MP4/MOV/M4V as the output video format. BTW, this video converter is also a full-featured video editor which can aid you to customize your output AVI video files by clipping video, cropping frame size to remove the black bars, adding downloaded subtitles and so on. Step 3: Select a destination folder to save the converted video files and hit "RUN" button to start to convert AVI to M4V, or MOV etc. formats for Apple TV. These three simple steps can also be used to convert AVI to iPad, AVI to iPhone, MP4 to MOV, M2TS to MP4, YouTube to MP3 , etc. The next step to solove the problem of how to play AVI on Apple TV is streaming the converted AVI to Apple TV after converting AVI to Apple TV. There are two useful tool you can choose to stream AVI to Apple TV： iTunes or 5KPlayer. Both of them are capable of effortlessly playing AVI on Apple TV. Now, follow the step-by-step guide as below. 1. Fire up iTunes on your Mac/Win. 2. Hit "movies" icon on the top of the iTunes window. 3. Figure out your converted AVI file and drag & drop this file to any blank space below "Home Videos". 4. Click on the "Home Videos" option. 5. Double click the file to start playing on your computer screen. 6. Tap the button next to the volume control and select your Apple TV from the popup menu. Later, your converted AVI video file starts playing on Apple TV. 1. Free download 5KPlayer on your Mac (Mac version) or Windows ( Windows version) computer and launch it. 2. Click AirPlay button on the top right corner and then the airplay receivers will pop up. 3. Choose Apple TV. Note that the AirPlay button will turn red if it is enabled. 4. Add the converted AVI file to this media player and then it will stream to Apple TV. Another way to play AVI on Apple TV is depending on video players for Apple TV. It is right that there are many video players and you don't know which one is proper. Here, we introduce you top two multifunctional Apple TV video players for your consideration. Serving as one of the most popular media players, VLC can play any video file formats with chapter navigation, subtitle and more on Apple TV without coverting first. It can play AVI files from UpnP, Windows shares (SMB), FTP, and even Plex servers. What's more, VLC is able to automatically donwload subtitles and artwork for users. Besides, it supports custom playback speed so that users can easily slow down or speed up video according to their different needs. To watch AVI on Apple TV, YouTube is an easier app comparing with other Apple TV video players because you just need upload your wanted AVI files to YouTube and watch them at any time. But remember to choose private option if you don't want others seen in the whole world. It is worth mentioning that you can access to any TV show or movie you have bought in Google Play Movies & TV through YouTube app for Apple TV since there is no official Google Play Movies & TV app for Apple TV. Can't play AVI on Apple TV? You are suggested to use the world's fastest AVI video converter - MacX Video Converter Pro to easily convert AVI to Apple TV MP4, MOV, M4V and more for playback with ease. Original quality reserved and world's No.1 fast speed. No virus, spam, etc.